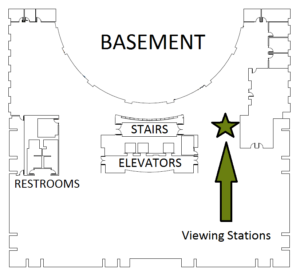 The DVD/VHS viewing stations, including a region-free Blu-ray/DVD station, are on the south side of the basement. DVD and VHS can also be viewed in Practice Presentation Rooms 20, 304, and 320 on large screens. Visit the Circulation Desk to borrow headphones or a portable LED projector for use with loaner laptops.